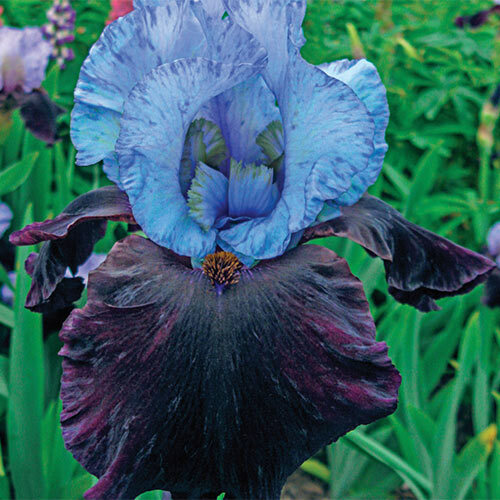 For a German Iris with outstanding color, a classic form and style to spare, consider Better Together. This U.S.-bred variety has all that and more… plus, it's a staff favorite in our American offices. Your customers will adore the velvety, light blue standards with cream veining and deep blue-violet falls that are nearly black in appearance. A subtle pattern of speckles covers each 5" wide blossom and adds an extra touch of colorful interest. Add 40" tall Better Together to back borders, mixed perennial beds and cutting gardens for stately seasonal beauty. Deer resistant and a born perennializer, it reappears year after year with ease. Remove spent flower stems after blooming. In late fall; cut back foliage to 6" fans. Clean plant debris before winter to prevent borers overwintering.